Thank you Matt Kwiatkowski for your post! THANK YOU so much for your readership this year! We are SO thankful for your support and look forward to talking more assessment with you all in 2016! Google’s Year In Search 2015 – I love the video but the raw data of top searches is fun too. The Flight of Refugees Around the Globe – They convey so much data in a few simple visuals; helps tell the story. A Quick Puzzle to Test Your Problem Solving – Who doesn’t love a little quiz? And this one relates your results to other aspects of thought. 10 Years After Katrina – The power of audio and hearing a story from the narrator’s mouth. Wow! 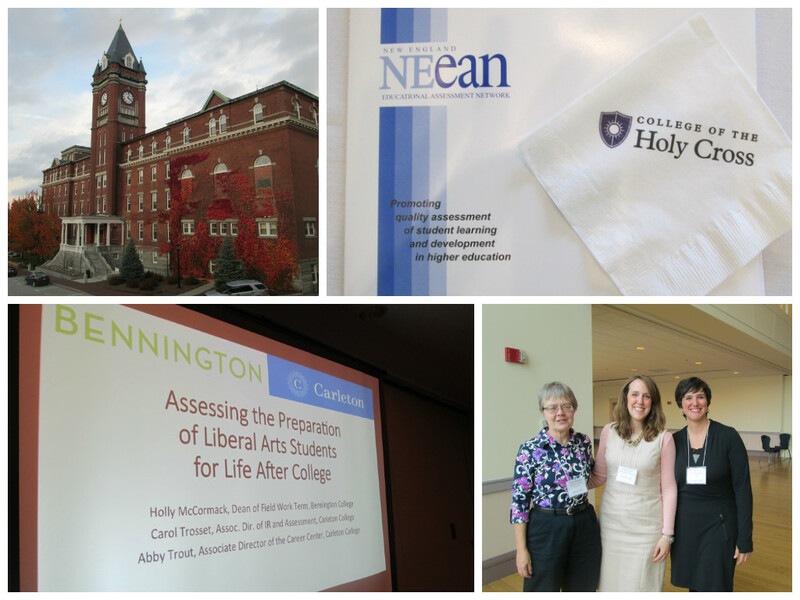 Last week I was at the Northeast Educational Assessment Network (NEEAN) fall forum at College of the Holy Cross. Wow – what an excellent conference! The theme of the conference focused on the past, present, and future of assessment in higher education. I co-presented with two incredible professional colleagues (see photo below): Carol Trosset (Associate Director of Institutional Research & Assessment, Carleton College) and Holly McCormack (Dean of Field Work Term, Bennington College) on assessing the liberal arts and its preparation for life after college via internships. Carol brought together the work she and Holly had been doing at Bennington with projects we’re in the midst of at Carleton to make this presentation. We had a such a great audience who brought insightful questions and ideas. Loved it! A big THANK YOU to my co-presenters Carol and Holly for a meaningful collaboration and presentation, and to NEEAN and Steve Weisler for such a hearty, learning-dense conference. Will You Be a Guest Blogger? When we started Oh No our hope was to have one LARGE conversation about assessment. Thusfar, it’s mainly been us talking to ourselves – which is fun but not achieving our goal. We want to expand the conversation about assessment in higher education, and the best way to do that is to invite creative, innovative professionals to help take the conversation further. We have lots of smart professionals in our lives already who are doing amazing things in various areas of higher education (see some of them below!). 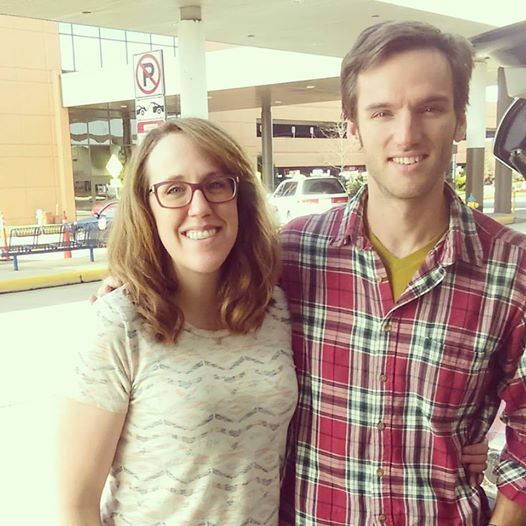 These friends of ours (and others who we don’t even know yet [i.e., hopefully YOU!]) will be adding their perspective in the coming weeks. We’d love for you to add your voice and fill in the gaps that we are missing. If you’re interested in adding to the assessment conversation we’ve started, let us know by filling out the form below. my group presentation at the New England Educational Assessment Network (NEEAN – try saying it 3 times fast) fall forum at College of Holy Cross. Stay tuned next week for Oh no, Friendship Summit edition. For this week, NEEAN! I wrote last time about great assessment collaborations and the NEEAN presentation is one result of those. You’ve all read our many, many, many (did I mention many) posts about learning goals/outcomes. My office ties several of our programs and services to nine student learning goals, and we’re gearing up to do that on an even broader scale. The Associate Director of Institutional Research and Assessment at Carleton (Carol Trosset) has been invaluable as we move into this next phase. At NEEAN, we’ll be exploring my office’s learning goals through one example of this expansion: our internship program. Students create learning goals and strategies prior to their summer internship. They write reflections during and after the internship about their learning, in order to capture their outcomes. Carol has been helping us code students’ goals so that we may understand on a larger scale what students intend and seek to learn prior to their internship. At NEEAN, we’ll be comparing Carleton’s process to the great process at Bennington College, where Carol examined the outcomes of student experiential learning. I can’t wait to learn more about the Bennington process and get inspired by so many my assessment professionals. 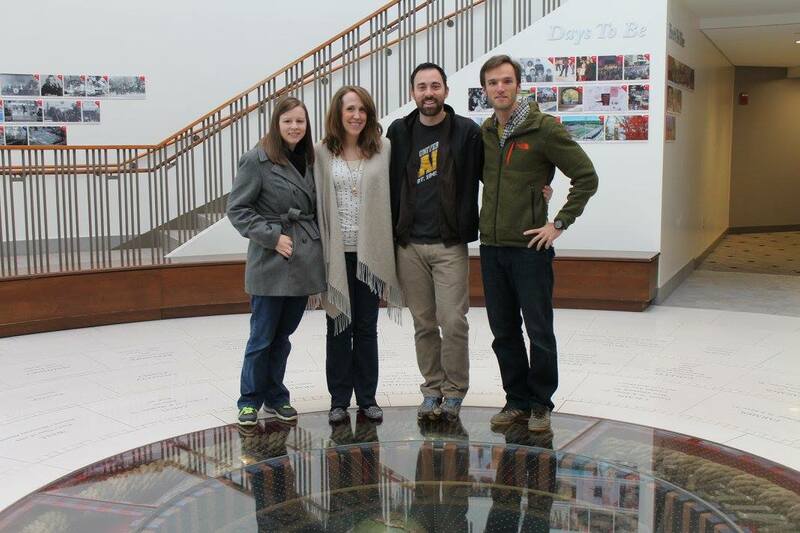 Next up on the home campus front, we’ll conduct focus groups with student interns about their learning outcomes. Over the next few weeks, I’ll have pre-interviews with student interns to start structuring the focus groups. So much great assessment happening – stay tuned for more assessment fun! Collaboration is an awesome thing. I’ve been working with various people and departments on campus on some exciting assessment projects over the last year. Good assessment takes a village; I can’t do it alone. It’s been a pleasure and a gift to benefit and learn from all the talent of my campus colleagues. Institutional Research: The associate director of IR and I have been working on all sorts of projects. One such project focuses on the learning goals our summer interns created prior to their internship. She analyzed these learning goals, coded the goals into overarching themes, and (eventually) will examine how those themes overlap with learning goals in the classroom (a project and expertise she’d initiated at a previous institution). ITS: Wow…ITS has helped our office with a number of incredible projects. Too many to list! They built a digital pipeline from our internal counseling note system (i.e., Symplicity) to the College’s data warehouse (read: so much data mining potential!!). And, they built us an interactive online career development tool for students – it’s an organizer, planner, and tracker all in one. Students can see our Career Center learning goals and the programs/services tied to each, select which they’d like to complete, pick a date they’d like to complete it by, and then check it off to track their progress. Did I mention, WOW?!?! College Communications/Marketing: College communications took our survey data about student interns and created some really beautiful data visualizations. I don’t have an actual proof to show you yet but the concept comes from *TIME Magazine. The original piece (see photo) focuses on income brackets, whereas, ours focuses on interns by year and shows data about students and their internships (e.g., geographic location of internship, top internship industries, etc.) along the sides surrounding a photograph of the student. Mathematics/Statistics Department: This academic department offers a statistics elective called Statistical Consulting – the class organizes students into consulting groups, takes on actual organizations from the community as clients, and helps the organization address their real current issues using data. The Career Center was a client – the student group reviewed our data about student visits and helped us better understand which students we’re seeing, how often, and during which weeks in the year. Conversely, we also have a better understanding of who we’re not seeing. Valuable insights from this collaboration. There are MANY other great departments and people collaborating with the Carleton Career Center; these are just a few from the last year. Assessing learning can be a blessed mess, so an ENORMOUS thank you to all the many people and offices who helped us achieve so many of our assessment goals. We couldn’t have done it without you! With whom are you collaborating?? *Barone, E. (2014, September 8). Who we are. TIME, 184, 53-58. Should we Assess Mental Health? Of the students I meet with for academic difficulty, a startling proportion of them are in their present situation due to factors related to mental health. The shape of the issue varies. Sometimes it’s the stress of seeing everyone around them succeed — struggling students tend to be quiet about their performance. Other times it’s a depression that was mild and undiagnosed in high school, but starts to take hold in college. These students want to succeed and have the capacity to, but something about college life tosses a wrench in their ability to perform academically. That I work at a competitive research 1 institution, most all of my students excelled in high school. Anyone who’s meeting with me for academic difficulty is seeing it for the first time, and rarely do they know how to cope. These days, I’m hearing many in the education world discussing grit — the ability to overcome struggle and bounce back from failure. We’re even using the term in our new student orientation. At the same time that we’re telling our students “we want you to challenge yourself!” they know that their GPA is the first way they’re measured for their next phase of life (grad school, med school, employers, etc). Sure, overcoming adversity sounds cool, but it sure doesn’t feel good while it’s happening, and for someone who’s always succeeded, that first “C” on an exam can feel like the first crack in the dam. It’s probably not much of a jump to conclude that a student experiencing mental health difficulty is more likely to struggle academically. And isn’t academic success part of the role of a fair number of student affairs offices? If we could identify the students struggling with mental health, we can go a long way towards supporting them through their journey. The challenge here is that most student affairs practitioners (myself included) are not experts at diagnosing mental issues. Balance that with the fact that we (i.e., advising, housing, etc.) are often the first to notice a student is struggling. Aren’t we also the folks charged with supporting the successful transition of our students into the college environment? I’m not quite comfortable claiming that we can be responsible in any way for the mental health of our students, or that fewer students with mental health challenges means that we’re succeeding, but I also believe that our response and support of these students should be a part of how our success is measured. Before 2010, I didn’t care AT ALL about sports. But, being the extrovert (and PROUD past-time bandwaggoner) that I am, I decided to get into football because that’s what people were talking about. So this Iowa girl started following the New Orleans Saints…a natural choice (former French teacher over here, remember? NOLA was the best I could do!). 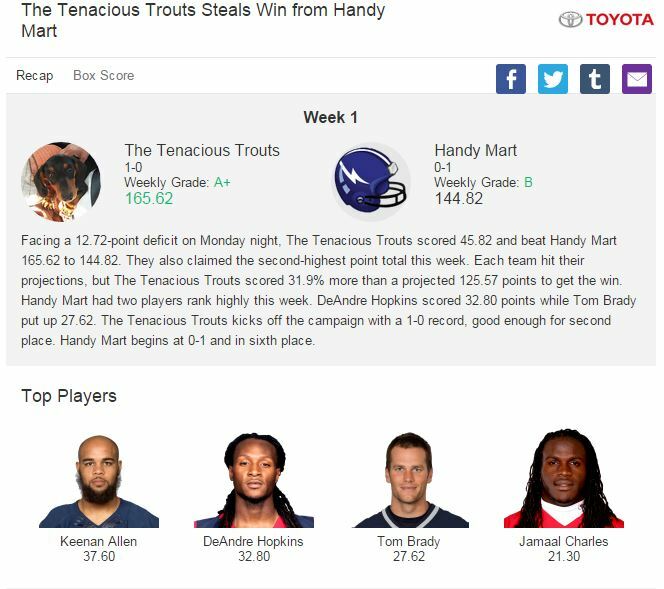 Anyhoo…we use Yahoo Fantasy Football (YFF) and one feature that I’ve enjoyed this year is the Game Recap. Yahoo blends together highlights from the “game”, images, and data to tell the story of (in this rare case) my amazing upset against another team, Handy Mart (no air quotes for that team – she’s won multiple years in a row!). 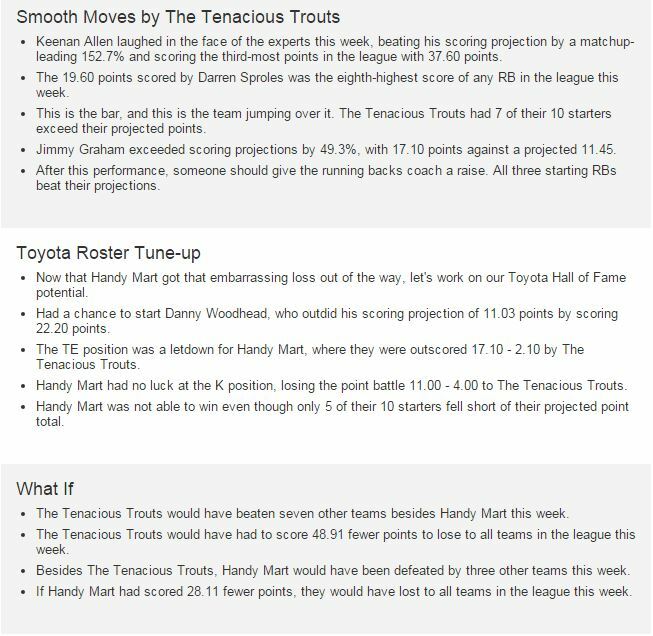 This game data recap makes reading about my fake team’s fake game much more dramatic and interesting than just the bunch of computer algorithms that it is. It weaves the story of the game data together so accessibly that it makes even the more nuanced highlights and plays from the game exciting for a sports novice like myself. And, in thinking about collecting data and assessing learning, really, isn’t that one of the main goals? Lots of offices collect data – and while that’s by no means easy, I think the deeper challenge is what do you do with that data? And how do you tell the story of your data (i.e., what students learned and were able to do as a result of your efforts) to make it accessible to important stakeholders? Cluster information into categories – not only will categories make your data much more digestible to your audience, but the groups in it of themselves will make telling the story easier for you and the audience. Use interpretive titles – show your data but also give it a title that helps the audience understand what they’re seeing/reading and what it means (the way a headline to an article quickly and succinctly communicates the main point). Blend images, text, and data together – there’s no need to exile all the graphs to one page and text to another. Instead, put them side-by-side so they can complement and strengthen each other. **I'd like to note that I have been the league champion ONE time! Again, a rare occurrence which probably was due to my opponents getting too busy to change their rosters, but I'll take it! So you’ve designed a new workshop, which you’ve guaranteed will bring up your student’s grades by a full letter! You spent weeks preparing the workshop, you gave the workshop, and now the grades are coming in. Did your students improve by a letter grade? That’s an easy calculation using descriptive statistics. Simply average last term’s GPAs among the students in your group and compare that to this term’s average. T-tests can tell you if a given experience (e.g., a workshop) impacts the mean score (e.g., grades) for a given student. When you hear folks describing “pre” and “post” tests, this is likely a scenario where t-tests are helpful. Regression can tell you if (and the extent to which) two variables are connected. For example, if you want to know if a students grade in calculus can predict their grade in physics. A regression analysis will tell you is there’s a relationship and how strong that relationship is. This test is appropriate when both variables are quantitative. Writing this post, it occurs to me that 1) trying to explain this stuff gets complicated FAST. 2) I’ve lost most of the details I learned in my statistics courses. The main idea here is that we have mathematical tools which can calculate for us how likely it is that a given experience or situation can predict another experience or situation. Want to know if career counseling helps students find a career? Statistics can answer that. The downside here is that not every statistic-based conclusion can be trusted. Much like Harry Potter’s wand,** this only works when a person knows (or at least sort-of knows) what they’re doing. I’ve noticed that it gets cold a few weeks after students arrive on campus — it’s the STUDENTS who cause winter!!!! In most cases, assessment doesn’t require statistics (beyond mean, median, etc.). As intelligent people with a limited amount of time on our hands, it’s okay to look at some numbers, make conclusions, and update our office processes. That said, if you happen to have someone on your staff with the time and the background, you’re in luck — you can start making conclusions about the effectiveness of your department practices. This allows you to identify the practices making a difference. In a time when resources are tight, the ability to carefully prune our student affairs bonsai trees (you’re welcome for that metaphor) will become more and more important. *This assumes your workshop was attended by a random group of students among the university. If, for example, the workshop was only advertised to engineering students, then your population would be engineering students. In short (and probably under-sufficient), your population is the group from which the sample comes. **This is just an assumption. I haven’t read any Harry Potter, but I assume he doesn’t want other people messing around with his wand.